Making an elaborate meal can be exhausting. Sometimes you need to go back to your roots, and make a simple, naturally-healthy recipe. These healthy recipes will taste amazing every single time, so you don’t have to worry about your picky eaters complaining throughout dinner. 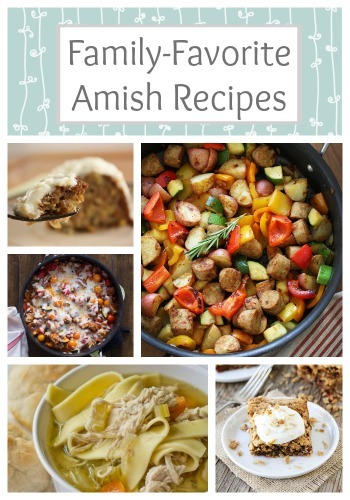 You can be sure that these family-favorite Amish recipes will please people of all ages. You’ll love how simple these recipes are to make, but it’s the amazing flavors of these 10 Amish Recipes that will ensure that you'll return to them again and again. So, make time for family, and serve one of these deliciously healthy recipes for dinner tonight. You definitely won’t regret it. Want even more recipes? Check out these 24 Simple Healthy Recipes for Your Family. You should definitely make one of these side dishes for dinner tonight. But, these aren't just side dish recipes. They can also be used for potlucks, holidays, and family parties. Or, you could make the easy soup recipes for a quick and healthy lunch. These recipes are insanely versatile, so you'll need to save these handy recipes for later use. You are going to absolutely LOVE these Healthy Soup and Stew Recipes. They're delicious! These Amish recipes will soon become your favorite recipes. Between the one-pot meal, the sizzling skillet, and the yummy casserole, you won't know which recipe to try first. In order to not stress over the tough choice, we recommend making it a random choice. Then, you can come back and try the next two healthy dinner recipes. Dinner isn't over until you indulge in a delicious dessert. Luckily these Amish recipes won't ruin your diet because all of these sweet treats are healthy. You can be sure that you'll want more and more of these yummy desserts. So, you should make these soon because they're the perfect treat after a long, tiring day.